Combine it with a massage, a delicious lunch in a beautiful location and great company, and you’ve got the ingredients for the perfect day. The only trick is finding the best place to visit and the best spa packages to suit your needs. While there are lots of day spas where you can enjoy massage and a range of beauty treatments, a day spa which provides the amenities and atmosphere of a resort is more difficult to find, particularly if you live in or close to Melbourne. Japanese Mountain Retreat is the only day spa in Melbourne which offers hot springs bathing, luxury day spa treatments, dining and accommodation in a luxury resort location. With flexible spa packages, choose your perfect experience. Enjoy a single treatment, or combine, two or three treatments and stay for a whole day, or overnight. 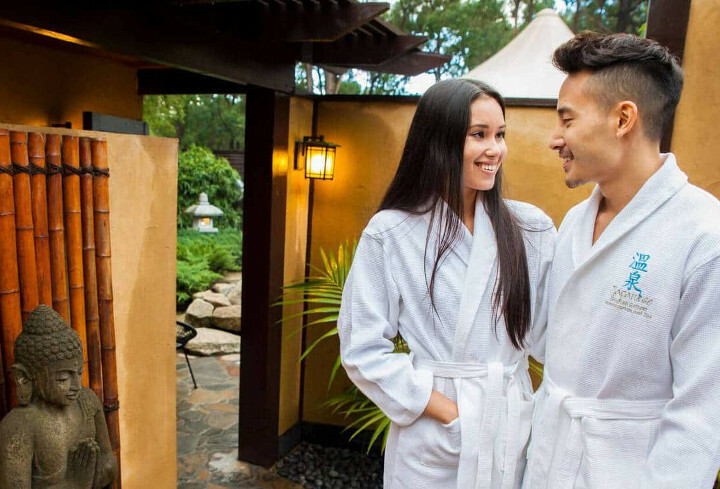 Japanese Mountain Retreat is the only luxury resort close to Melbourne with day spa packages designed for special celebrations and romantic occasions. Whether you are celebrating a birthday, an anniversary, or just want to relax and chill out with your partner for a night, there are a choice of accommodation spa packages for one or two nights. Your secluded romantic getaway includes staying in luxury Japanese villas and a combination of bathing and spa treatments, as well as romantic dining and breakfast in the resort restaurant. Japanese Mountain Retreat has the best romantic accommodation in the Dandenong Ranges for couples looking for a luxury resort experience. One night accommodation packages begin at $1,259 with Japanese Chillout. Two night accommodation packages begin at $2,249 with Destress & Unwind. Dreaming about lying in an outdoor hot pool, surrounded by nature, rarely involves a crowd of people. Bathing in complete privacy with a partner or a small group of friends is the ideal way to enjoy hot springs. Unfortunately, this level of privacy is not available at most outdoor hot springs. It is at Japanese Mountain Retreat. Japanese Mountain Retreat is the only Melbourne hot mineral springs that allow outdoor bathing in complete privacy. Bathe outdoors in a fully landscaped pool, surrounded by nature. You and your partner will experience absolute seclusion and can enjoy bathing with or without clothes. Hot mineral spa bathing is also available indoors, in the luxury Spa de Marrakech. Immerse yourself in waters heated to 39 degrees, in a traditional style Roman bathhouse and steam room. A massage at Japanese Mountain Retreat is an experience you will never forget. Lie on the latest technology massage bed in a room lined with golden mosaics, while your muscles and body are gently soothed and relaxed. Japanese Mountain Retreat offer the only spa packages in Melbourne for those who want to experience traditional middle eastern body treatments at a luxury resort. For a blissful full body skin indulgence, a Traditional Hamman Ritual for one hour will leave your skin reinvigorated and soothed. Your body will be pampered with nourishing ingredients. Start with a black olive soap and steam, followed by exfoliating the body with a kessa mit. Finish with soothing sheah butter to soften the skin. This spa package includes indoor bathing and steam treatment in the Roman Bathhouse, followed by a gentle exfoliating sand scrub and luxurious massage. The ultimate couples experience. Spend just under two hours having your skin pampered and soothed with rich oils and decadent herbs. Begin by exfoliating the body with a Hamman Ritual, followed by a romantic couples mud bath and steam treatment in the Roman bathhouse. Finish with your choice of massage or facial. A full list of of other spa retreat body treatments are available. After enjoying hot mineral spring bathing or a luxury treatment, it is always important to replenish the body with water and cleansing, healthy foods. At Japanese Mountain Retreat, all spa packages are available with an option to dine in the resort restaurant. The lunch menus include Yum Cha or a Japanese inspired lunch with fresh, seasonal ingredients. All guests staying overnight enjoy a three course dinner, as well as breakfast. The restaurant also caters to special dietary requirements. The best day spa packages in Melbourne, are available at Japanese Mountain Retreat, only a 45 minute drive from the centre of Melbourne. The resort is located in the Dandenong Ranges, at the gateway to the Yarra Valley. For a truly memorable day or couple of days, head to Japanese Mountain Retreat.